Healthy Vows -- Shed 50lbs With Your Spouse At Your Side! It took the urging of a loved one to finally make Sarah see that things had to change for the sake of her health and marriage. Read on to see how she found the support to change her body and life! I have a great Southern family that unfortunately believes the secret to a happy life is more butter and sweet tea! When I meet my would-be-husband (senatemiles on BodySpace) in college I was overweight and had the self-esteem of a toilet! He was extremely fit and introduced me to healthy eating and weight-lifting. I have to admit at first I only did it because it made him happy and I was afraid if I didn&apos;t lose the weight I would lose him. But as the weight came off so did my fear of putting myself out there and challenging myself ... doing things that before I would have said were impossible for me! Now I love being able to lift more than the guy sitting next to me in the gym! 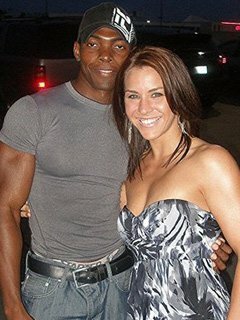 When my husband and I started dating I weighed about 195 and he was already lean and ripped. We had been dating for a little over a year. One day out of the blue he came home and told me that he was ready and wanted to marry me, but first we needed to talk. I am sure you can imagine how that conversation went. You see, Deji believes marriage is like a 30-year mortgage on a house. No matter how much you love the property, if you know it&apos;s going to flood 5 years down the road, are you going to buy it? No. My husband loved me for who I was, not what I looked like. I would cry, struggle and come up with excuses as to why I couldn&apos;t do it for another ten months until I realized that I was the one being selfish. He wasn&apos;t asking me to change for him; he wanted me to change for me. I needed to be healthier, get rid of my asthma and hopefully improve the way I saw myself especially as a married woman. Does THIS babe look like she needs a puffer? Fortunately for me, my husband was also my personal trainer. The first 3 months of my training, before I even stepped foot in a gym, went to treating the causes of why I gained so much weight. My trainer helped explain food as nothing but energy and regardless of what I ate, if I ate too much I would gain weight. He helped teach me how I can still enjoy the foods I love without getting in trouble and still make progress. Kind of like teaching an alcoholic to be moderate with alcohol rather than quitting cold turkey. I stepped foot into the gym for the first time in august of 2009 and have never looked back. My trainer works on my diet consistently monitoring my nutrients and all, I never have to cook or step in the kitchen! Deji is there to love, support, and slap a wrist if he needs to. He plans my meals based on how active my day is going to be. But on average I eat about 3 maybe 4 times a day, about 5-6 hours between meals, but eat a little larger portions. It was so hard! I want to be honest about this because I remember at the time thinking that fit people were fit because they actually hated ice-cream and just craved broccoli at night, that the pain and strain of lifting heavy in the gym and the soreness the days afterward just didn&apos;t apply to them, at least it couldn&apos;t hurt them as bad as it did me. "They just didn&apos;t get how hard it was!" There is a degree over time that your body will adapt to the pain of working out and so in that respect it will get easier. But nobody loves to work out. Nobody loves not getting to go to their favorite restaurants every night eating, drinking and whatnot, but instead stays home with their salmon and veggies and hits the sack early so they can wake up early to do cardio/training before their crazy busy lives begin! They don&apos;t do any of that because it is magically easier or more fun for them. They do it because it has become important to them. It has become a priority in their life! The best way to keep your eye on the prize is by looking in the mirror. Note: All our movements are done standing, for more real life feel and calorie burn. To sum up, what I&apos;d like you to take from this is two things. First off, starting the journey is half the battle. Know you won&apos;t be perfect, you&apos;ll get discouraged and you&apos;ll mess it up. But as long as you don&apos;t quit, you can get there. I know it is scary and hard but courage is not the absence of fear, it is merely our reaction when faced with our fears. Secondly I can&apos;t tell you how many times people approach Deji and I and told us how lucky we were to have a spouse that is in the gym/kitchen supporting each other&apos;s fitness goals! This journey is hard and harder still when you and your significant other are on two different pages but something I&apos;d have you think about is this: If your spouse is asking you to come to the gym or eat healthy, listen. Give them a chance because it could be them telling you that they would rather work to make it with you than leave to find it with someone else. If you are the spouse doing the asking, remember anything you are asking them to do you must be willing to do yourself. You cannot ask them to wake up and do cardio to lose weight while you sleep in, even if you don&apos;t need to do the cardio. You cannot ask them to eat healthy if you aren&apos;t, even if it doesn&apos;t "affect" you. If you do it ... do it as a team! Ad Astra Per Aspera! It means To The Stars Through Adversity!